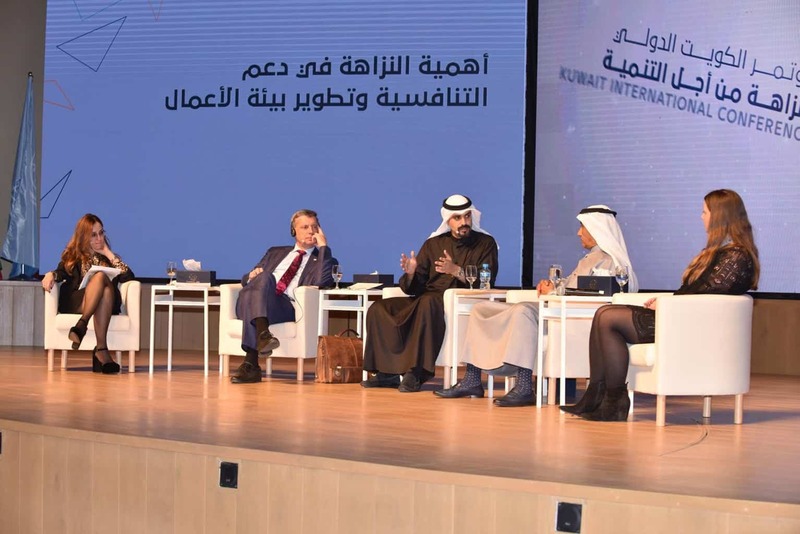 Held under the patronage of His Highness the Amir Sheikh Sabah Al-Ahmad Al-Jaber Al-Sabah, Kuwait International Conference: Integrity for development was held during the period January 15 and 16 2019, in Bayan Palace and Jaber Al-Ahmad Cultural Centre (JACC). KDIPA’s Director General Sheikh Dr. Meshaal Jaber Al Ahmad Al Sabah participated in the conference and moderated the third session under the theme “Incorporating Integrity into Economic Reforms and Developing the Business Environment”. The session reflected on the national efforts exerted, and the reforms undertaken, in full cooperation between public and private sectors as well as the civil society to streamline business environment and enhance competitiveness in the State of Kuwait, while adopting best international practices in transparency and integrity to achieve sustainable development goals within the National Vision 2035 “New-Kuwait” pillars.